I know we just had a Swedish Royal Family post yesterday – and we’ll have another one on December 20 when the entire family attends the Swedish Academy formal gathering – but I just had to post these new photos and video. The Palace released three new photos of Princess Estelle for Christmas, along with a video of Estelle and her parents, Crown Princess Victoria and Prince Daniel, decorating the Christmas tree at their home at Haga Palace. You know how Prince William is a psycho about not letting the public see Prince George except for very special occasions to thank the media for being good little lackies and not disobeying him? Well Crown Princess Victoria is much more open with Princess Estelle. Not only does Victoria show Estelle more often, but it’s for more than just private photo sessions where the pictures are released weeks later. Victoria brings Estelle to official engagements (in Sweden!). Because Victoria understands her job and her child’s position in life. So yesterday, December 17, Victoria brought Estelle for the traditional receiving of the firs. More tiaras! Last night, December 11, King Carl XVI Gustaf held the annual dinner for the Nobel Laureates at the Royal Palace in Stockholm. All the royal ladies (and gents) were out to welcome the laureates to the palace. Because this is a white tie dinner, we get more gowns and more tiara photos. Yay! The gowns were different, obviously, but the only royal lady to switch up her tiara game was Queen Silvia. Crown Princess Victoria and Princess Madeleine stuck to their trusty fringe tiaras from the day before. Sofia Hellqvist still didn’t wear a tiara, but she did wear a hair brooch. Silvia, Victoria, Madeleine, Sofia: Which Swedish Royal lady looked best at the Nobel Prize Ceremony? Cue the mic drop, Crown Princess Victoria just schooled everyone in how to bring the fashion dramz. Victoria went all out stunning for the Nobel Prize Ceremony at the Stockholm Concert Hall and Nobel Banquet at Stockholm City Hall in a red, strapless ballgown accessorized with a fringe tiara. This is what I think of when I think of a Princess. That’s not to say that Queen Silvia, Princess Madeleine, and Sofia Hellqvist didn’t look fantastic, they did, but Victoria stole the show for me. Anyone want some tiara action from the Swedes? On Tuesday, November 18, King Carl XVI Gustaf and Queen Silvia of Sweden held the year’s second Official Dinner at the Royal Palace (the first one was in March). The Dinner saw the King, Queen, Crown Princess Victoria and Prince Daniel, and Prince Carl Philip and Sofia Hellqvist greet representatives from the diplomatic corps, parliament, government, government agencies, science, sports, business, culture and the people who met the Royal Family on trips. The unexpected news of Kate Middleton’s second pregnancy has overshadowed at lot, and will continue to dominate the press until the new royal sprog is born next April (seriously, the press will find any and all reasons to talk about the royal baby, including telling us what HG is even though they did that already with the last pregnancy–and do we really need other women’s accounts of it, Daily Mail? Or other women’s accounts of dealing with two kids under two? I don’t think so). Now that I’ve gotten completely sidetracked… This post is about the Swedish royals, because I won’t let them be forgotten just because Kate decided to get knocked up again. The World Childhood Foundation celebrated it’s 15th anniversary yesterday, September 9, and Queen Silvia (the founder), Princess Madeleine and husband Chris O’Neill, and Crown Princess Victoria and husband Prince Daniel attended the gala dinner in honor of the anniversary. Queen Silvia and Princess Madeleine were busy September 8 as well when both attended the third International Council meeting held at the Royal Palace–where they discussed issues common to the four sister foundations in Sweden, USA, Brazil, and Germany. 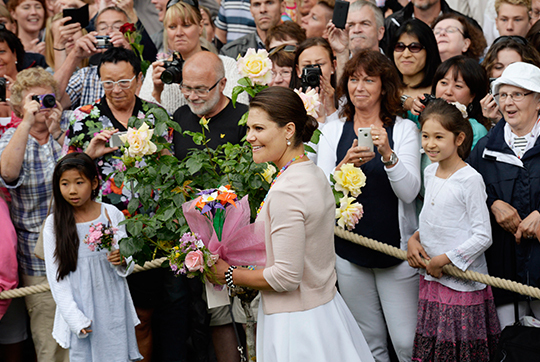 Crown Princess Victoria of Sweden celebrated her 37th birthday Monday July 14. Victoria was born Princess Victoria on July 14, 1977 as the first child of King Carl XVI Gustaf and Queen Silvia. In 1980, the laws of succession changed and she became the heir apparent and was made Crown Princess. Her birthday is marked as a national holiday, Victoria Day (Victoriadagen). Crowds gathered outside Sollidens castle in Oland to celebrate her birthday, where the King gave a speech. For this event, Victoria was accompanied by her husband Prince Daniel, their daughter Princess Estelle, Queen Silvia and King Carl XVI Gustaf. Princess Leonore, daughter of Princess Madeleine of Sweden and Chris O’Neill, was baptized this morning at the Drottningholm Palace chapel in Stockholm. Leonore was pretty well behaved. She was a bit fussy when they arrived, but calmed down and didn’t even cry when she was baptized (unlike her mother, Madeleine, who wailed). Part of the baptism includes Leonore receiving the Order of the Seraphim—that’s the little blue sash and pin she received. Leonore was born on February 20, 2014 at 10:41 EST in New York City. Her baptism comes on her parent’s first wedding anniversary (more on that below). Happy National Day, Sweden! 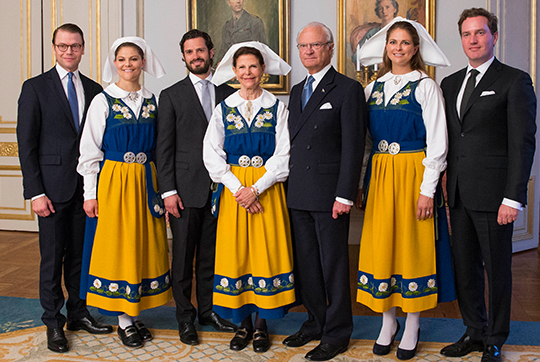 June 6 is the National Day of Sweden, and the Royal Family was out in celebration. Even little Princess Leonore joined in! Some history of National Day: it was established in 1915 as Swedish Flag Day; in 1983 Flag day was merged to form National Day; National Day is celebrated on June 6 to mark two historical events, the date Gustav Vasa was elected King in 1523 and the date the Constitution Act was signed in 1809.